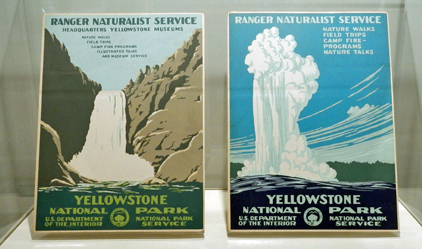 For a donation of $250, you will receive a set (two prints) of our recently discovered and recolored Yellowstone WPA serigraphs. These bear the screen printer's initials "EM" and are also signed by Ranger Doug! The limited edition numbers also match--a wonderful addition to your home and a welcome donation to the Traveler. Enjoy!